When you think of mountain cabin, modern and funk aren't words that come to mind. So we jumped at the opportunity when our clients talked about their dream of a small, modern chalet. Words like alpine, funk, and gezellig drove the design direction. With a simple palette of black, white and whitewashed wood in place, we planned calculated hits of color and pattern to warm the space but also keep the focus on the high ceilings and big windows. Above: The kitchen and the living room are basically where everyone wants to spend time so instead of being tucked away, the architect planned these spaces on the 3rd floor with windows on all four sides. To bring out the gezellig vibes, we designed a double height brick fireplace surround with linear gas insert. Above: We mixed a custom Almost Black color we're now calling, Casework Black, because true black felt too cold. 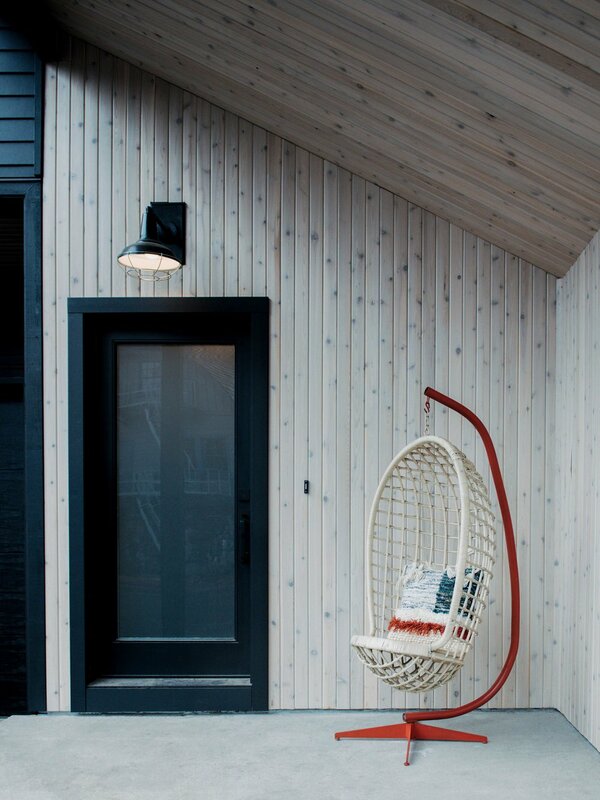 The porch is wrapped in white washed hemlock to define the entry and balance the black. Above: Whitewash hemlock balances an all-black exterior and creates a welcoming entry. The sconce is from Schoolhouse Electric and the chair is vintage. Above: To balance the stoic fireplace we brought in a mega sectional and covered it with a custom designed fabric. A shearling ottoman ties it all together and brings in those cabin vibes. Side tables, table and floor lamp and floor pillows are from Schoolhouse Electric. Above: An off the shelf sectional seemed so plain in such a neutral space, so we took one of our major inspiration pieces, a painting by Jan Davidsz. de Heem, 1650 - 1683 and designed a fabric which we put on a big sectional. The rug, side table, and table lamp are from Schoolhouse Electric. Above: White quartz counters and black laminate cabinets were used to keep cost down. The kitchen table is where the family hangs out during meal prep or after a long day on the mountain. The large black pendants from Schoolhouse Electric were customized to work with the vaulted ceiling. Above: Custom bunks with a powder coated ladder and rail were added in the kid's room for sleepover and mountain vibes. All bedding is from Schoolhouse Electric. Above: A chunky black farm style table and bench are paired with light gray Windsor style chairs. This multipurpose table is for meal prep, eating and all the fondue you can handle. Above: The bathrooms were also kept simple. Quartz counters with black laminate cabinets. We added a solid maple edge and dowel legs to make the cabinets more durable. 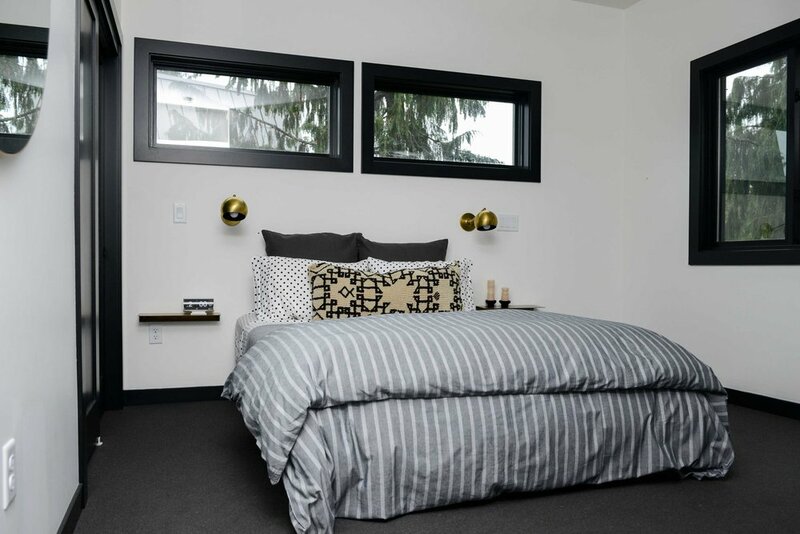 Brass sconces from Schoolhouse Electric and matte black plumbing fixtures were used throughout. Above: A custom steel perf banana yellow bench for taking off snowy boots rests on a black rubber floor. The rug is by Kat + Maouche and the surface mount is from Schoolhouse Electric. Above: We kept the master simple: white walls, black trim and black carpet. Sconces and bedding from Schoolhouse Electric. Lumbar pillow from Kat + Maouche.